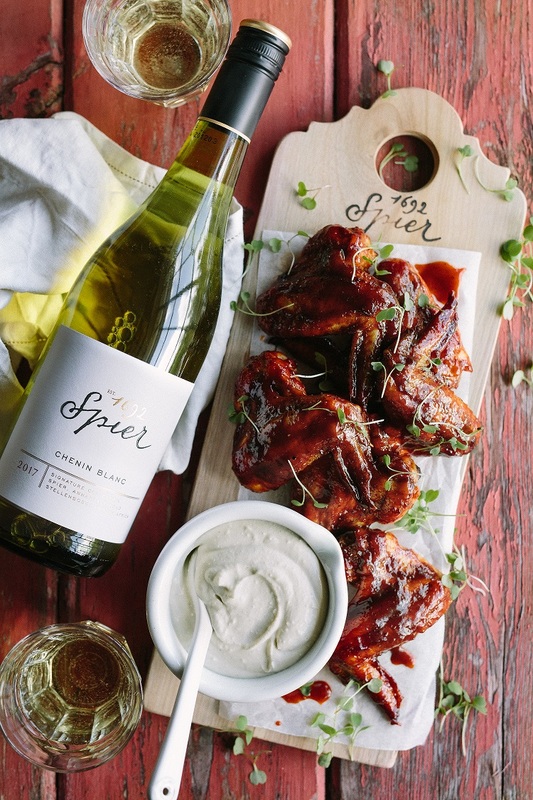 Home » Lifestyle » Sizzling sticky hot wings with Spier! Sticky chicken wings are one of South Africa’s best loved snacks. When having friends or family over, you can’t go wrong with presenting a platter full of wings alongside a mouth-watering blue cheese dip! The only way to get the chicken wings really glossy and sticky is to re-glaze them a few times while cooking. Keep on going (about 3-4 times) until you get the desired result, then serve hot or at room temperature with this zippy Southern-style blue cheese dip and a glass of Spier Signature Chenin Blanc. Make the sticky marinade: In a medium size mixing bowl, add all the ingredients for the marinade (except the chicken) and mix together. Pour over the chicken wings in a sealable container and marinate for 30 to 60 minutes (or longer – overnight). Preheat the oven to 200C. Line a roasting tray with foil, then arrange the marinated wings in a single layer. Roast for 30 minutes, then remove from the oven and use a pastry brush to brush with more marinade. Return to the oven, and keep on brushing every 10 minutes until the wings are very tender and the edges are dark, glossy and sticky. Remove from the oven and serve hot or at room temperature. Make the dip while the chicken is roasting. Mix all the ingredients in a food processor and until smooth and thick (thin it with a little milk if its too thick). Keep any leftovers refrigerated in a covered glass jar. The Spier Signature Chenin is both crisp and fruity with green guava, pear, apple and hints of litchi on the nose. It has a well-balanced palate and a strong finish. Maturation occurred on the fine lees for another three months to give extra body and elegance. The wine is unoaked. The Spier Signature Chenin Blanc retails for R52.00 a bottle and is available at leading liquor outlets nationwide.